Looking for a great bag for your long fins and snorkeling gear? 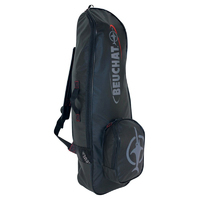 The Beuchat Apnea Fins Backpack Bag is the perfect addition to the free divers or spear fishermen's dive kit. The bag is organizational designed for all your free diving equipment with an outer zippered pocket for mask and snorkel. Large zippered main compartment for long blade fins and exposure suit. All pockets have dual slider zippers with slider pull tabs.